I remembered planting okra in my little garden in the backyard. My mom is a great lover of okra. She almost eats it every day. She just steamed it and dipped it into the vinegar with soy sauce. And I get a little bit jealous of her the way she eats it, like there's no tomorrow. It looks very appetizing to her. So I tried it because I couldn't resist myself watching her having so much fun while eating. 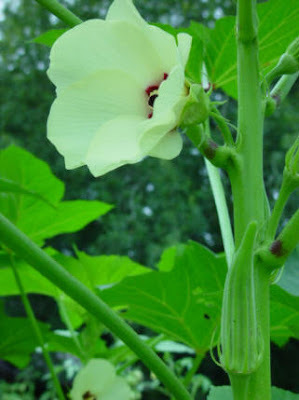 I know okra, like other veggies, has a good number of health benefits. According to some researchers, eating okra is one of the best ways to prevent constipation, cancers, and it helps maintain low blood sugar.